Long <s> is a typical feature of 18th-century English spelling, as James Boswell’s letter, reproduced elsewhere in this blog, shows. But though it disappeared from printed texts around the turn of the 18th to the 19th century, it still appears in private letters as late as 1845. There are various instances of long <s> in the first Browning love letter made available online on Valentine’s day (see the image below). 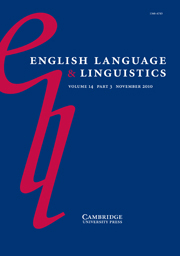 Just recently, an article came out on the history of long <s>, by Lyda Fens-de Zeeuw and Robin Straaijer, called “Long-s in Late Modern English Manuscripts“, English Language & Linguistics 16/2, 319-338. This entry was posted in 18th-century letters, 19th-century letters, news and tagged long s. Bookmark the permalink.